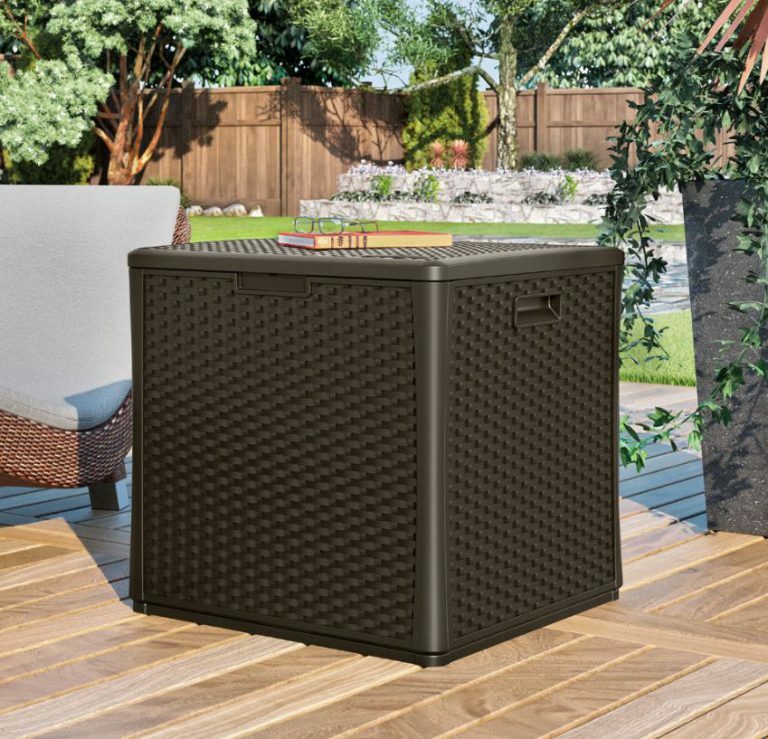 Suncast’s outdoor storage cube resembles an elegant wicker construction manufactured from supremely durable, easy cleaned, recyclable resin delivering endurance to combat the ever-changing weather conditions. A cubed deck box suchlike this delivers a spacious repository for a wide selection of outdoorsy accessories such as a place to shelter patio necessities along with the convenience of storing those awkwardly sized furniture cushions that previously presented a nuisance for our concerns with regards to finding ample cupboard space inside to squash them out of sight. Alternatively, the roomy interior caters to harbor away swimming paraphernalia and towels located poolside, provides a decent sized hoard box for kids toys that organises quick tidy-ups once the lid’s ajar, a place to hideaway small gardening tools & plant feed, a storehouse for BBQ grilling tools & fuel supplies or maybe place to throw the balls into at the end of a game. Another popular scenario regards emptying the contents once Autumn approaches and storing them in the loft or garage meantime convert the box into a dry log store for firewood over the winter’s period. These styles of deck box have no particular purpose, their multi-functional usage best describes the reasons for their global sales. We’re delighted with the way our chosen model delivers a handy service situated on the patio. Performing a 2 minutes tidy-up by filling the box & closing the lid on Summer’s evening before bedtime epitomises their convenience. 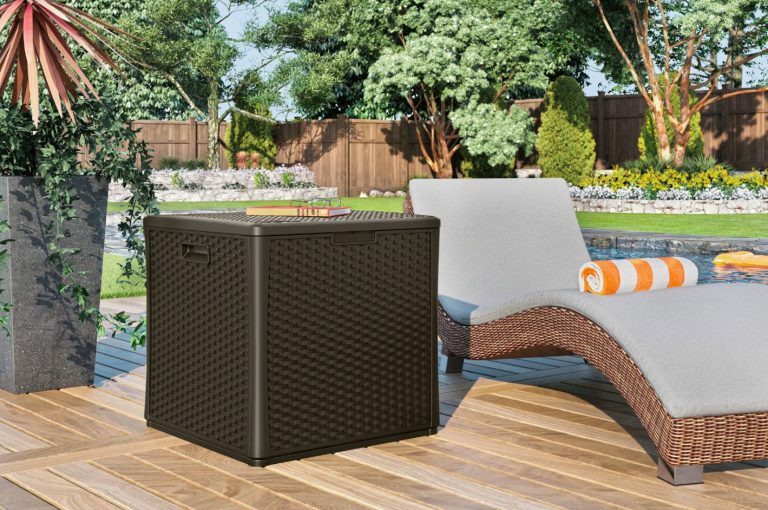 There’s a few spacious deck box cubes including this Suncast design that currently receive the huge thumbs-up from purchasers, Keter’s Deck box Cube being the most prominent competitor. Visit Deck Boxes, a visual page exploring the various sizes & styles of deck boxes. Scroll down to the style that captivates your interest & tap the image to read the detailed review. Suncast’s manufacture constitutes an entirely recyclable resin called polypropylene which satisfies our environmental concerns. Fortunately this superlative durable plastic resists decomposing, lasting season after season and year after year which is great for our benefits however it’s encouraging to note this plastic maybe re-used into the next generation of deck box cubes, there’s a welcoming thought. Producing rigidity is Suncast’s method, derived by manufacturing a thickened structure of multi-layered fascia panels through a procedure termed blow molding. This progressive molding method forms an inner skin comprising a series of deeply wide resin ridges to enhance robustness to the construction whereas the outer-skin is where the molding shapes & crafts exquisite wicker styling along with subtle curvy sides. A mocha java tint blends within the manufacture to exhibit rich brown tones in addition to the potency of UV inhibitors that protectively stabilise the composition with armoury to sustain the pressures of sunburn scorch blistering, cracking and bleaching the fascia. Due to polypropylene’s immunity from rot & weather related damage, longevity is enhanced meanwhile to freshen-up appearances when dirt ingrains into the wicker indentations, best practice is to use a soft brush to avert marking the surface or alternatively, empty the compartment and hose it down. A helpful aid regards washing up liquid or mild detergent however refrain from using bleaches and abrasive cleaners as these may scratch & cause damage. Suncast’s cube design comprises a flat lid therefore provides usage for table-top services and accommodating drinks on top. A few suggest bringing the drinks out on a tray determines an even flatter surface due to the rattan crevices however like the images portray, the box stylishly furnishes any patio or poolside with a handy side table. Just to give an idea of how robust the box construction is, a few people mention it comfortably seats an average sized adult however I haven’t read any documentation by Suncast suggesting the use of seating services therefore best not to advise. Presented both sides of the cube situate hand-grips to enable conveniently lifting the box and positioning to the desired location without emptying all the contents. The spacious interior is able to accommodate 60 gallons / 224 Litres storage capacity providing an ideal compartment for those sizeable outdoor seating cushions meanwhile Suncast’s weatherproof design assures clean, fresh & dry internals are maintained due to small gaps present in the way the construction connects together. A clever design that prevents mould growth & musty odours developing by generating fresh air to the interior meantime prevents rainfall from entering. The lid incorporates two scissor-hinges linking both sides to the box body in addition to a singular gas shock piston fitted to the right-hand side. The gas pressure aids opening the weighty lid meanwhile maintains an open position when fully ajar, providing a useful feature for the likes of swift toy tidy-ups and organising bulky cushions. During closure, the piston’s force intercepts, preventing the full weight smacking down and trapping fingers. The premise of Cube’s build involves interlocking the 4 fascia sheets into the periphery of the base panel followed by attaching both scissor-hinges to the lid and box body virtue of securing with screws and nuts. Finally, the gas shock pistons are fitted to assist the opening and it’s ready to stock with storage and serve. Keter’s Deck Box Cube constructs in 10-15 minutes due to comprising 8 screws, the whole thing simply snaps together and receives exceptional feedback. This Suncast Cube does receive the odd downgrade due to frustrations during assembly, it’s mainly the hinges & pistons that cause the odd headache whereas it has to be said, others flow through the process seamlessly. 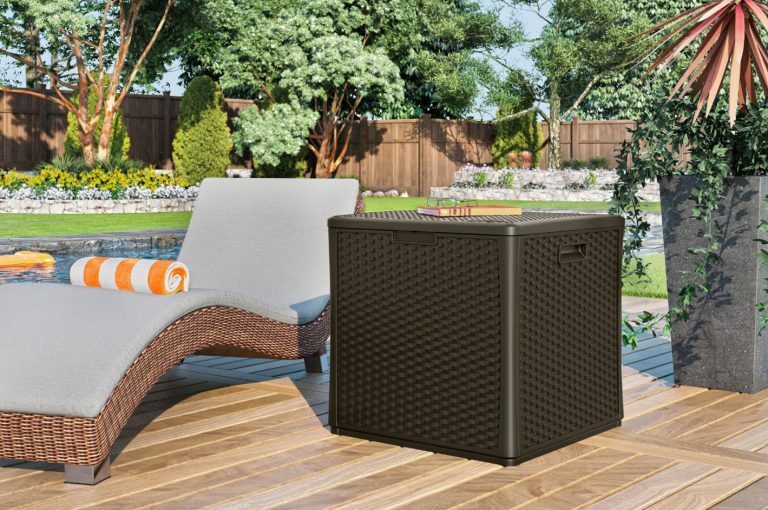 Suncast’s cubed deck box furnishes patios, urban balconies and poolsides with an irresistible presentation by mimicking the mirror image of enchanting wicker patterns in weather-resistant polypropylene, exhibited in java shade. If you’re on the lookout for a stylish cube shaped deck box that doubles up providing a flat surface for drinks & alfresco dining, the curvy lines & adequate height provide the perfect accompaniment to outside furniture with the handy bonus of being able to open the lid and protectively shelter delicate fabrics . Suncast’s recyclable storage cube has achieved worldwide sales due to the eye-catching presentation, sturdy construction and user-friendly features. Add the 5 years warranty to these benefits along with the fair price, you can see the attraction. 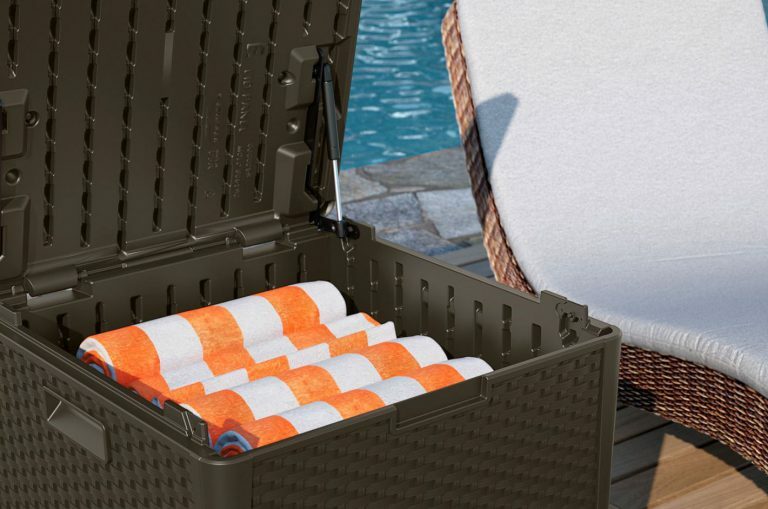 Hope Suncast’s outdoor storage cube’s provides plenty of inspiration for your Summer convenience. Share your favourite cubed shaped deck box below along with any relevant questions. Please share Suncast’s Deck Box Cube. Thank you. Love it! I am all the time looking for a storage box of some kind for my firewood. The wood always makes such a mess. This will be the perfect solution! 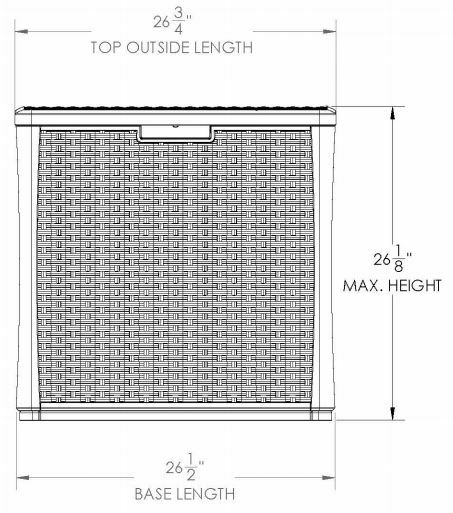 Hi Cris, thanks for taking an inspection of Suncast’s cubed deck box for fire-log storage. Like you are aware, storing wood prior to burning demands a dry environment which makes the internals of a deck box or low-profile store a handy piece of kit to stock & serve, especially over a winter’s period. There’s a wide assortment of deck boxes to choose from if you prefer larger dimensions enabling to store more wood, explore these alternative garden storage box sizes. Most deck boxes comprise the conventional rectangular shape yet come in an assortment of styles and sizes occupying various storage capacities, Keter’s deck box cube on the other hand represents the main rival, delivering a 50 gallon storage capacity, if the square design better fits your circumstances. If even larger dimensions are desired, able to accommodate a large pile of fire-wood, take a look at the range of horizontal units we’ve so far reviewed, they’re like a mini shed sitting less than half the height of a walk in shed. These range from the original inexpensive facilities to the charming displays of recently designed storehouses, all perfect for storing fire-wood. I am hearing it for the first time about this useful device.Suncast Storage cube seems to be a wonderful gadget. A defender against rot and weather demise is something marvellous. I encourage every reader to kindly follow the cost efficiency and the durability shown and adhere to this beneficial review. I wish all the best in this rare and unique niche. Hi H, thanks for stopping by to explore Suncast’s storage cube. The make-up comprises polypropylene which is blow-molded and artistically crafted into the most exquisite wicker pattern however mixing within the polypropylene are UV inhibitors to defend to composition from the scorch of sunburn attack producing fractures and colour fade meanwhile the resin provides durability against weather depreciation and immunity from rot. Another benefit relates to the weatherproof design that maintains a dry interior simultaneous to ensuring prompt drainage is delivered meanwhile the faint cracks where each panel interlocks produces a continuous air current of freshness to the compartment to suppress the occurrence of mouldy growth developing on fabric materials. Most deck boxes nowadays construct through a similar procedure in order to generate fresh air. Hey Christina, thanks for inspecting Suncast’s cube version of a deck box. This is a popular storage box due to Suncast’s exquisite design, the attractive appearance does captivate interest meanwhile providing table-top services for drinks and alfresco mealtimes conveniently doubles up services. Moreover, it makes a handy addition as a side-table next to a sun lounger or in between two chairs forming a bistro set, potential’s huge when you wear your imaginative hat. 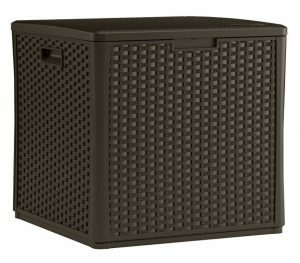 This cube accommodates 60 gallons of storage capacity, so like you mention it’s a tad smaller than the longer alternatives however if a wicker-style lights you candle, take a look at the collection of deck box reviews I have so far created. There’s some large & extra large deck boxes in the longer rectangular shape with identical wicker creations that’ll accommodate a whole lot more than this mini size. 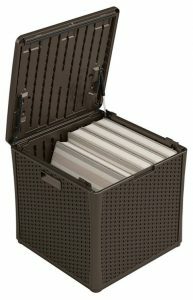 I never thought of carrying with me a storage cube when going somewhere. But it’s a good idea when you and your family go together on a picnic, or anywhere else requiring several small things to carry with. Since the storage is a Suncast it will preserve drinking water for a period of time. This suggests something about being organized especially when the place is limited. I would say this idea is helpful to everyone. 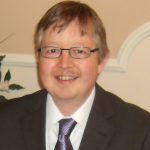 Hey Jimmy, thanks for calling in to read about Suncast’s outdoor storage cube. The main idea behind a storage cube or deck box is to have them situated on a patio, home-yard, poolside or on the balcony. Their service predominantly includes sheltering outdoor accessories suchlike those large lounging furniture cushions, swimming supplies, equipment and towels, sporty stuff and toys, small gardening tools like trowels & feed meanwhile many use them for keeping fire-logs dry during winter-time. We find ours really convenient sat in the back garden accommodating seating cushions as their bulkiness always presented problems where to store them out of sight inside the home. Having a flat lid doubles up as a really handy side table meanwhile if you go for the more sturdier longer deck boxes, they provide bench seating too, thereby delivering triple services.